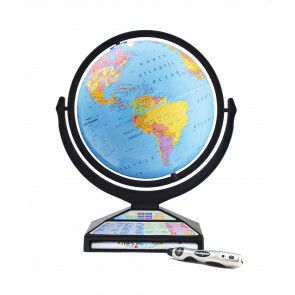 Our wide range of Children's Globes that will educate and excite young explorers of all ages. The vivid colours of the Illuminated kids globes offer even more opportunity for learning into the night as you explore the ball for your favourite places or features, or lighting up the room around you with a spectrum of vivid colours from the earth as an excellent night lamp. Illustrated globes add an extra level of excitement to the ball and are excellent for the youngest of explorers, adding drawings of their favourite animals in their natural habitat letting them learn about where each animal lives. The Intelliglobe is the smart globe that makes learning about the world even more enjoyable by teaching through interactive games and engaging facts. For older children / young adults looking for more detail the cartography of the National Geographic range is stunning as well as educational whilst looking great illuminating a room, or the highly detailed cartography of the Explorer, Traveller, Pioneer and Atlantis globes.